Everybody knows the best way to a South African man’s heart is through a braai. However, to get him in touch with his inner soul, you need to feed him some Peppermint Crisp Tart! I don’t know what it is about this simple dessert, but seems to have a profound affect on most South Africans, inducing bouts of childhood nostalgia with every bite and even the odd misty eye (they aren’t crying of course, its just that pesky braai-smoke). Sometimes referred to as a Fridge Tart and occasionally as a Transkei Mud Pie, Peppermint Crisp Tart was arguably the South African dessert of choice in the 80’s and early 90’s. The very definition of a store-cupboard dessert, it was originally made with Orly Whip (a long-life non-diary cream substitute) instead of cream, meaning you literally did not have to buy anything fresh to make the tart – you could whip it up in 15 minutes, pop it into the fridge to set and voilà: dessert bliss! Today Peppermint Crisp Tart jostles with the mighty Malva Pudding for the title of South Africa’s favourite traditional dessert and whilst Malva Pudding may have a greater claim to that crown, Peppermint Crisp Tart must come a very close second. 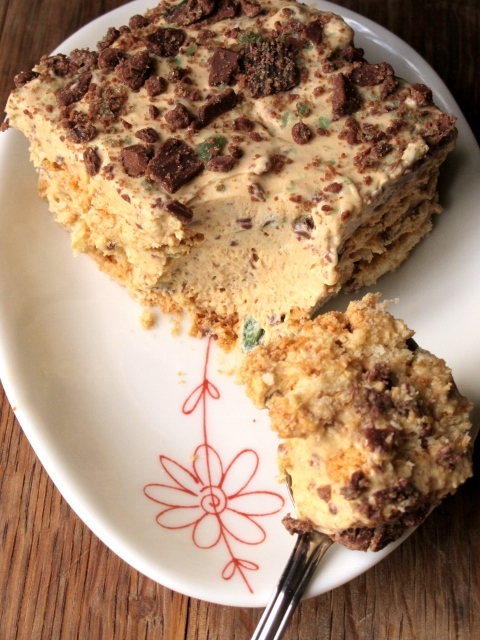 The key to Peppermint Crisp Tart’s enduring appeal is its convenience. All you need to make it are: 4 ingredients, a bowl, a whisk, a dish and a fridge – you can’t get easier than that! Now I won’t lie to you, South African’s love their desserts jaw-achingly sweet and Peppermint Crisp Tart is no different – this stuff is not for the faint of heart! I’m not the biggest fan of desserts, but even I can’t resist indulging in a small portion of this decadent dessert. Why? Because, to put it mildly, Peppermint Crisp Tart is AMAZING! Something rather magical happens to the ingredients as the tart sets in the fridge, creating a masterpiece of dessert decadence that needs to be tasted to be believed. Is it subtle? Most definitely not. Is it the greatest 4 ingredient, non-cook dessert ever conceived? Quite frickin’ possibly.